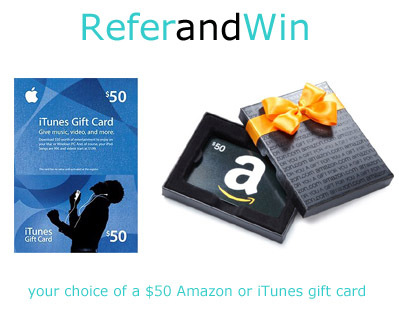 REFER AMDesign Studios services and WIN a $50 gift certificate! Introducing the Refer and Win program! We are offering your choice of a $50 Amazon or iTunes gift card for any referrals that lead to an invoiced job for our ebook formatting, copy editing or story synopsis services. Refer your friends or colleagues for one of the above services. Make sure they mention your name and email in their initial email. If their referral results in an invoiced job, you will be rewarded with your choice of an Amazon or iTunes gift certificate in the amount of $50! It’s that easy! Offer expires July 1, 2012. Referral must result in an invoiced ebook formatting, copy editing or story synopsis job. This offer does not apply to graphic design, author branding, cover design, premade covers, or author branding. 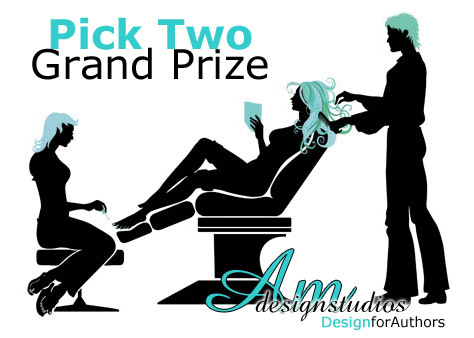 AMDesign Studios is pleased to offer a “You Pick Two” Grand Prize Package! One lucky winner will get his or her choice of ONE specialty ebook service from BOTH Amanda and Ann (the AMs of AMDesign Studios – designers dedicated to author services)! The prize includes your choice of a free Author Branding Package or free Custom Ebook or Print Cover (from Amanda) AND your choice of either a free Copy Edit Package, a free Ebook or Print Formatting Package, or a free Synopsis Writing Package (from Ann). Learn more about the contest on L.M. Stull’s blog. Click on over to L.M. Stull’s blog. She’s hosting the give-way. Leave a comment on the blog post for the give-away and you’re officially entered. Sign-up for the AMDesign Studios newsletter. Your name will be entered in the drawing. The winner will be selected in a random drawing at the end of May and announced in a follow-up to this post on L.M. Stull’s website, Mande Matthew’s blog, and AMDesign Studios. Are you ready? Go enter! Enter by leaving a comment on L.M. Stull’s website. Enter by signing up for AMDesign Studios’ newsletter. It’s thought to have originated as a blend of the words irrespective and regardless, with the first documented usage traced back to around 1912. Perhaps it may have been used in this context: “The Titanic has sunk, irregardless of her reputation as the unsinkable ship! Extensive use of the word brought it to the attention of commentators as early as 1927. To this day, the most frequently repeated remark about it is “there is no such word.” But, in fact, there is such a word, and it can occasionally be found in edited prose, although you are most likely to encounter it primarily in dialectal American speech. For those who still insist that “irregardless is not a word,” you can take a measure of comfort and justification in the fact that although irregardless may appear in modern dictionaries, it also comes with the following one word caveat: nonstandard. Here’s another interesting fact about the word irregardless: according to a list on their website, it is the 65th most popular word on Merriam-Webster.com. If you are like me, now you are curious about the number one most popular word. Any guesses? Ann Mauren provides affordable copy editing and ebook formatting services. She’s also a logophile.